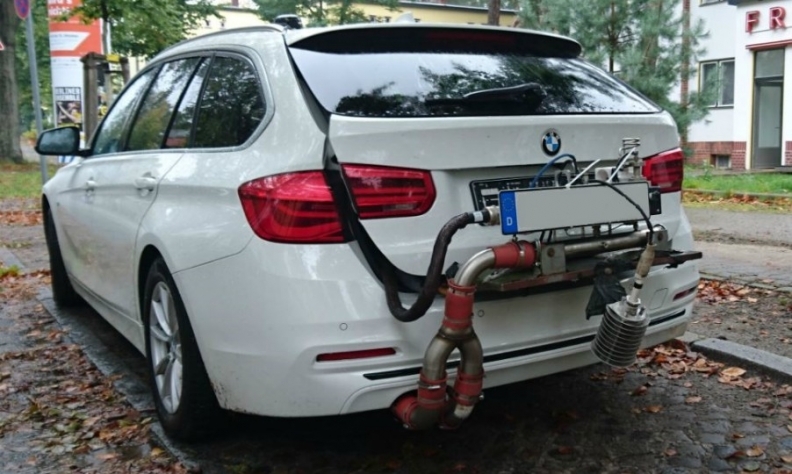 DUH claims the BMW 2.0-liter 320d wagon emitted NOx levels up to 7 times above the legal limit during testing. BERLIN -- BMW denied that engine management software shut off a system filtering nitrogen oxides (NOx) emissions in some of its diesel cars after a German environmental group alleged that a 3-series car in a series of road tests emitted amounts of NOx that were seven times above the legal limit. The 2.0-liter 320d wagon, which is designed to meet the latest Euro 6 standards on emissions, exceeded the statutory cap of 80 milligrams of NOx per km by an average of 2.6 times in eight road tests and even by 7.2 times when the car's speed was increased by 10 percent, Deutsche Umwelthilfe (DUH) said on Tuesday. However, in a separate set of static roller-bed tests also conducted by the DUH in October, the results of which were not independently verified, the same BMW car's NOx emissions remained significantly below the 80 milligrams per kilometer limit at normal speeds and when the speed was increased by 10 percent, the group said. "The results give very clear signs of unlawful defeat devices in the engine control software," DUH managing director Juergen Resch told a news conference. "The vehicle must provide for fully functional exhaust gas cleaning in all normal operating situations." The DUH's findings were reported by German broadcaster ZDF's program WISO and daily newspaper Tagesspiegel on Monday evening. The automaker by sales denied any wrongdoing. It said its vehicles complied with legal requirements and had not been manipulated, a position it has maintained ever since Volkswagen admitted in September 2015 to cheating in U.S. NOx emission tests. The automaker's development chief, Klaus Froehlich, on Tuesday dismissed the allegations as a campaign against BMW and said the manufacturer would fight the accusations. The DUH said it has asked the German Transport Ministry and the KBA motor vehicle watchdog to review the type approval for the BMW 320d model and issue a mandatory recall for affected models should its test results turn out to be correct. The Transport Ministry couldn't be reached for comment and a spokeswoman for the KBA motor transport regulator declined to comment.